That heading is only slightly flippant. 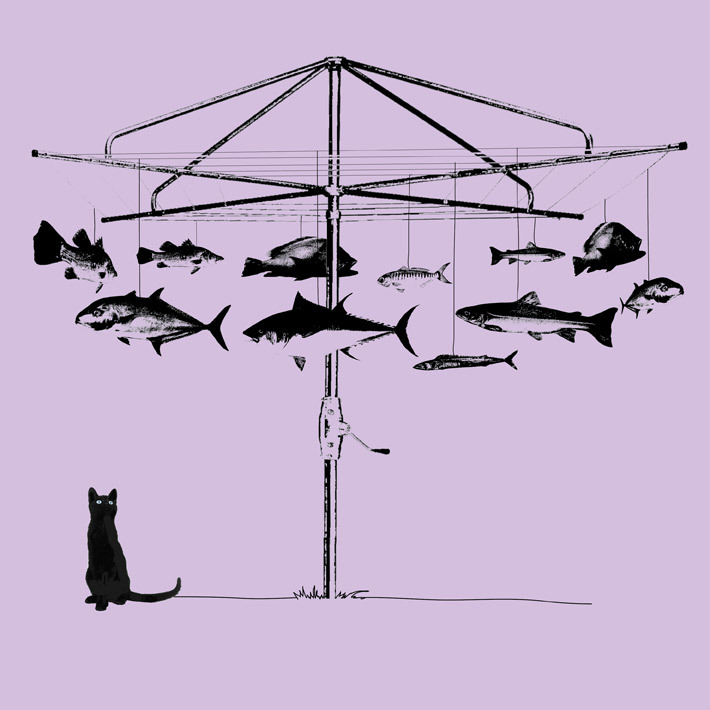 When I am sitting at my market stall and someone expresses an interest in our ‘Backyard Fishing’ tee, I enjoy telling the story of how that design came about – and it is how most of our t-shirt and design ideas are formed. By thinking for a while, sometimes years, about things, and trying to make meaningful connections to and between them. Ms Smith and I have known each other forever. She has one of the most creative, laterally running brains I have ever encountered and was, way back then, as she is now, an inspiration for my science-mathematically trained brain. She has taught me over the course of our friendship that I am actually better suited to more arty pursuits. I am drawn to things that hang or are suspended by wire or string. On a few of Ms Smith’s birthdays I got the idea of hanging the same number of objects as years she was turning as part of a celebration and present for her. One time I hung a circle of candles from fishing wire attached to the grape vine trellis in our inner-city backyard, then as twilight came, I made her stand in the middle of them and I lit them. It was a lovely sight and soon transformed in a completely unplanned yet beautifully appropriate way when the candle flames melted the wire, meaning the candles started plopping randomly to the concrete to continue burning down slowly into a circle of still-lit puddles. Another year I got it in my head to make a sculpture out of wood, wire – and fish, which Ms Smith loves in all kinds of ways. I bought a couple of tins of herrings in tomato sauce, I think it was, and onto my crude t-shaped wooden stand with pieces of thick wavy wire sticking out horizontally I threaded the appropriate number of fish. I was very pleased with my fishy birthday sculpture. The problem was, so was our cat, who became very keen on shredding the structure. She jumped first onto the table where the present was standing and then spent the next hour meowing frantically and attempting to get to the fish sculpture which I had shifted up to the top of a cupboard. I can’t actually remember what Ms Smith thought of my effort when she came home. A decade or more later, I was sitting in my backyard in the sun one morning having a coffee, staring at the clothesline. As I said, I love hanging things, and had been trying to figure out how I could get this most humble and ordinary of iconic Australian objects into a t-shirt design. And then I saw in my mind those fish. I hurried in to the office and put together the clothesline and fish design. It looked fine, but something was missing.